The best deck build to maximize Cassie's abilities in Paladins. 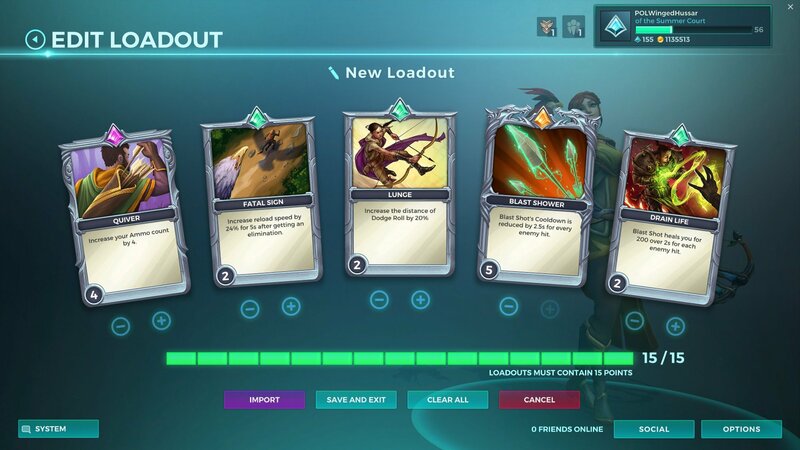 With the release of Paladins on Nintendo Switch, gamers have been wondering what the best deck builds are for Cassie. In Paladins, Cassie is a Damage Champion who uses deals direct attacks through her Crossbow. Cassie is an extremely agile Damage Champion, able to dodge attacks using her Dodge Roll ability. While Cassie is quite versatile, newcomers to Paladins may find her challenging to master. To help, we put together a quick guide on the best deck build for Cassie in Paladins! We suggest the deck build shown above when it comes to playing as Cassie in Paladins. 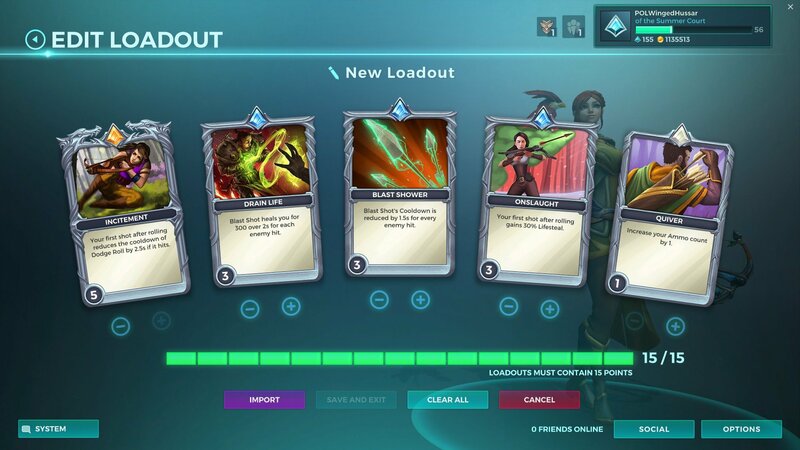 Based on the selection of cards shown above, the best deck build for Cassie boosts the damage dealt using Cassie’s Crossbow. Note that you’ll need to level the cards shown above as you go along to further improve your Cassie deck. Impulse: Increase the damage of Blast Shot by 250 and reduce the cooldown by 2 seconds. Quiver: Increase your ammo count by 1-5. Fatal Sign: Increase reload speed by 12-60% for 5 seconds after getting an elimination. Lunge: Increase the distance of Dodge Roll by 10-50%. Blast Shower: Blast Shot cooldown reduced by 0.5-2.5 seconds for every enemy hit. Drain Life: Blast Shot heals you for 100-500 over 2 seconds for every enemy hit. Crossbow: A crossbow that deals 680 damage every .75 seconds. Disengage: Shoot an arrow that deals 200 damage and blasts the target backwards. Blast Shot: Fire an explosive projective that deals 450 damage. Dodge Roll: Quickly roll in the direction you are moving. Scout (Ultimate): Send your bird into the sky for 8 seconds, revealing enemies to allies and granting you 30% movement speed and CC immunity. Again, the reason we suggest the deck build shown above for Cassie is because it boosts the amount of damage her Blast Shot deals. Every hit and elimination counts in Cassie’s favor, building stacks that are ideal for clearing off an objective or payload. Many Paladins players consider this deck build to be “OP” for Cassie due to the sheer level of boost it gives her. Of course, if you’re looking to experiment with a different deck build for Cassie in Paladins, we suggest giving the following a try. For an enhanced focus on Dodge Roll, you can give the deck build above a try when playing Cassie in Paladins. Exaction: Deal 30% bonus damage for your next shot after Dodge Roll. Incitement: Your first shot after rolling reduces the cooldown of Dodge Roll by 0.5-2.5 seconds if it hits. Onslaught: Your first shot after rolling gains 10-50% lifesteal. Quiver: Increase your ammo count by 1-5. This deck build is similar to the first one we suggested with added bonus to Dodge Roll. If you are a Cassie player who finds themselves relying on Dodge Roll, this secondary deck build may work better for you. Of course, both are equally viable when it comes to buffering Cassie’s abilities in Paladins. Cassie is a damage champion, though she plays differently than shooters like Viktor or Tyra. She can be squishy when cornered by multiple opponents, so using her Dodge Roll and natural agility is key to staying alive and maximizing your kills in Paladins. It all depends on your play style as well, so be sure to experiment and work with cards that improve the skills and abilities you use most when playing as Cassie. In the comments below, let us know how you like to build Cassie’s deck in Paladins, and what tactics you use to make the most out of this agile damage Champion. For more on Paladins, be sure to check out some of our previous guides including the best Paladins Champions to play in each class, the best deck build for Tyra in Paladins, and the best deck build for Koga in Paladins. By reading through this guide, you should now know the best deck build for Cassie in Paladins.